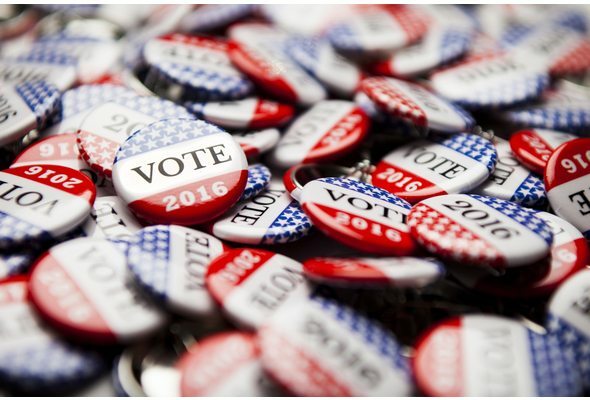 Almost all political discussion today is centered around the question, “how will this affect the economy?” The issues which the Trump and Clinton camps base their campaigns around like immigration, trade and tax policy are debated in terms of productivity and jobs. So who is correct, liberals or conservatives? Should we raise minimum wage? Should we stop immigration? What will the impact to the economy be in the short term? The long term? These aren’t easy answers. So we went to the data. By focusing on the hard numbers, we can look at ideology in the aggregate. 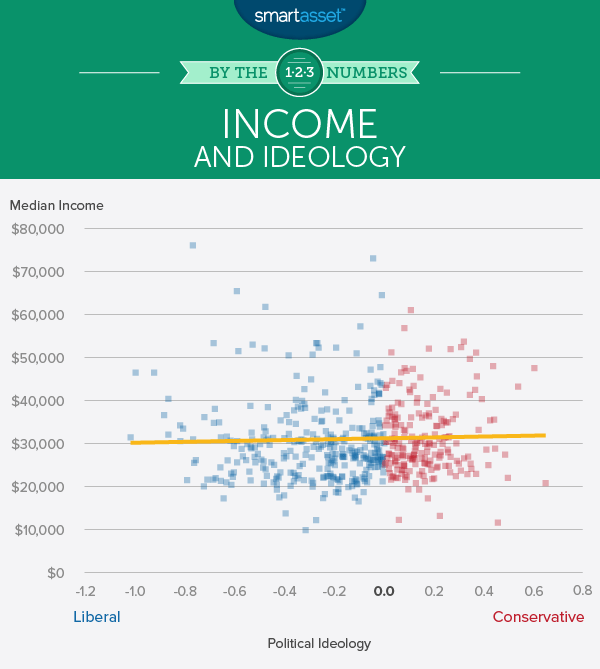 We set out to see how a city’s political leaning relates to its economic conditions. Recent research from The American Ideology Project has made analysis like this possible by giving an ideology score from -1 (most liberal) to 1 (most conservative) to many U.S. cities. The drawback is that the score is the average policy preference for all policies not just economic ones. We at SmartAsset decided to compare the ideology score to economic and social indicators like unemployment rate, median income, education rates, marriage rates, cost of living, rate of population change, upward mobility and median age to see if there were any strong relationships. We also compared the ideology score to a few of our own studies to look for relationships. For more information about how we compiled the data please see the data and methodology section below. Not much difference. For most of the economic factors we looked at, there didn’t seem to be a huge difference depending on the city’s political leanings. Marriage matters. Marriage rates had the strongest relationship to a city’s political leanings in the data we analyzed. 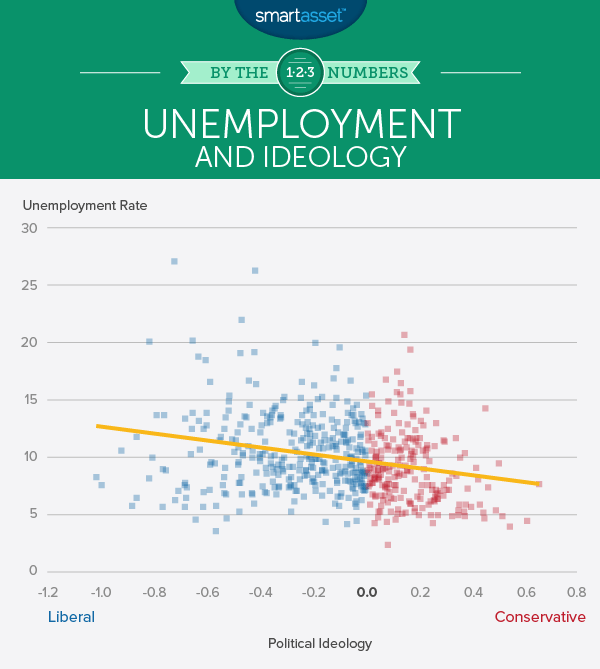 Overall, the data shows that conservative cities make the tiniest bit more in income than liberal cities, while liberal cities tend to have higher unemployment. A few liberal cities stand out as outliers in the chart. Palo Alto, Mountain View and Sunnyvale are all fairly liberal cities in California with very high median incomes. All three are large cities in the Silicon Valley region. Another grouping of liberal cities that are outliers include Washington D.C., San Francisco, Cambridge, and Seattle. Meanwhile, Mckinney and League, Texas are two mid-sized very conservative, wealthy cities. Detroit (27.1%) and Flint (26.3%) are two outliers on the other chart. They are liberal but have higher unemployment rates. Meanwhile, Arlington, Virginia is a fairly liberal city with the low unemployment. The city with the lowest unemployment rate (2.4%) is the slightly conservative (.078) Bismarck, the capital of North Dakota. 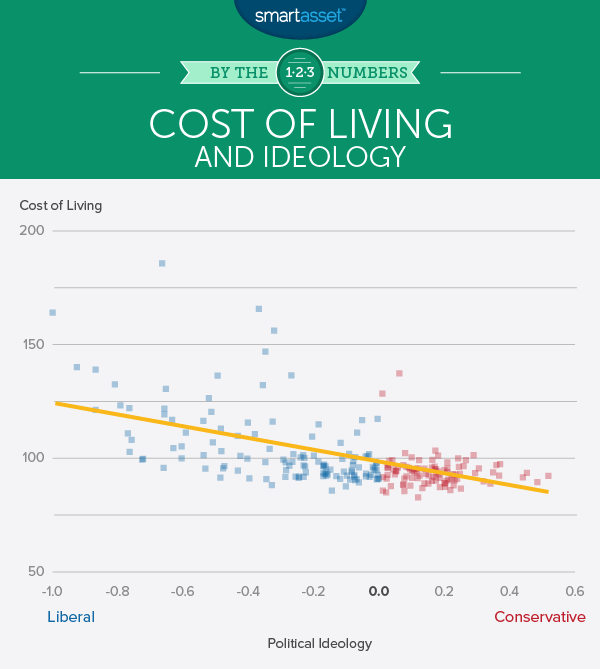 Our analysis shows that cost of living has a fairly strong correlation with the political leaning of a city. Liberal cities generally appear to have a higher cost of living than conservative cities. San Francisco is infamous for its high cost of housing. Other liberal cities with high costs of living include New York City, Honolulu, San Diego, Stamford and Los Angeles. The two large outliers on the conservative side are the two large Alaskan cities, Anchorage and Fairbanks. Though they are conservative, they have a higher cost of living. 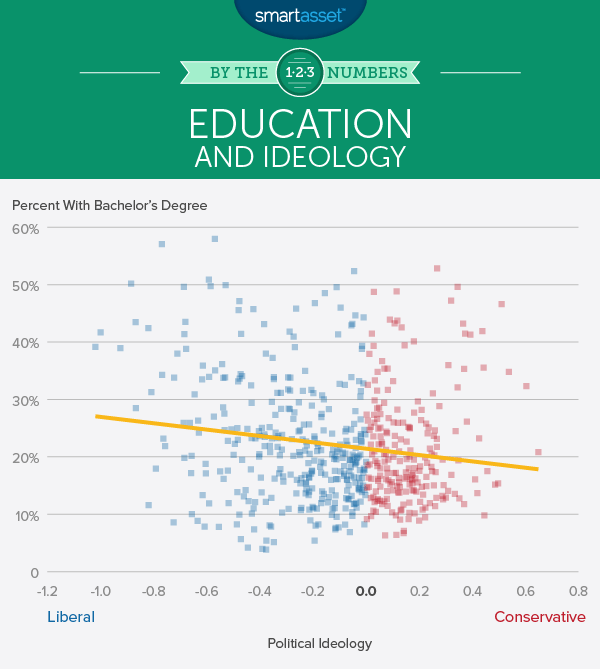 The data shows that liberal cities tend to be slightly more educated than conservative cities. The two most educated liberal cities in our study are Arlington, Virginia and Palo Alto, California. The most educated conservative cities are Fishers and Carmel, both in Indiana. One of the strongest relationships we found in the data was between marriage and ideology. The more conservative a city is, the higher the rate of marriage in that city. One outlier on the conservative side is Provo, Utah. It has a conservative score of 0.45 and a marriage rate of only 45% (relatively low). 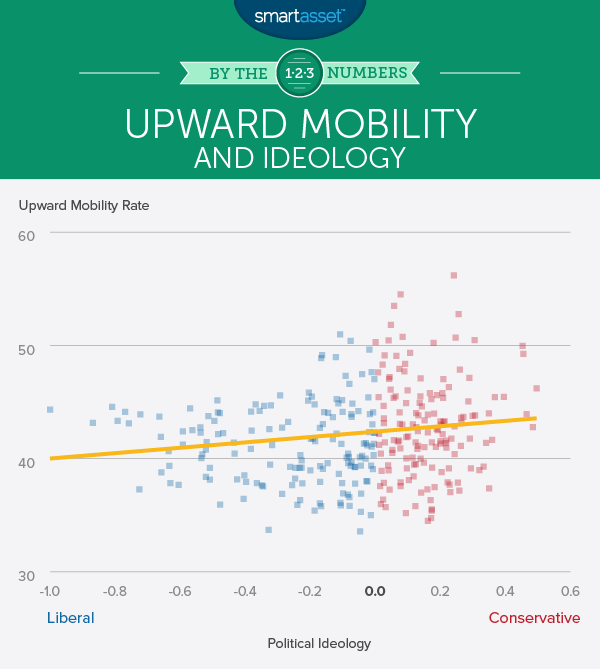 Our analysis shows that the trend between upward mobility and a city’s political ideology is mostly flat. The city with the highest upward mobility (56.23) is the slightly conservative (0.24) Minot, ND. 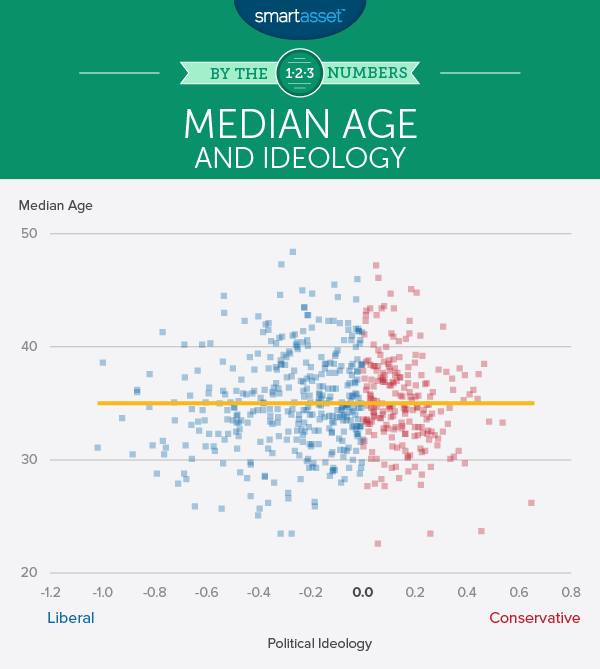 The relationship between median age and political ideology is also mostly flat. There are a few outliers though. Orem, Utah is the most conservative city (0.64) in this dataset and also one of the youngest (median age 26.2). Walnut Creek, California is the oldest city in this data set (48.4) and also slightly liberal (-0.26). 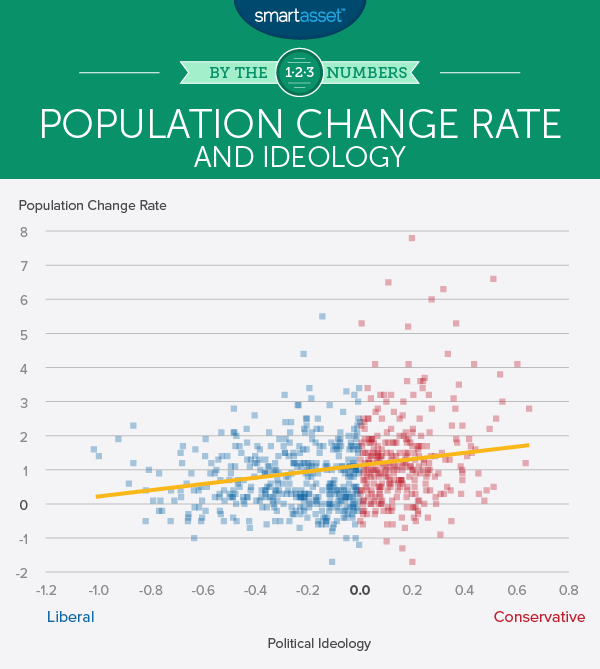 Our analysis shows that conservative cities tend to grow faster than liberal ones. Extremely liberal places like Berkeley, CA (-1.01) and San Francisco (-.99) are outliers. 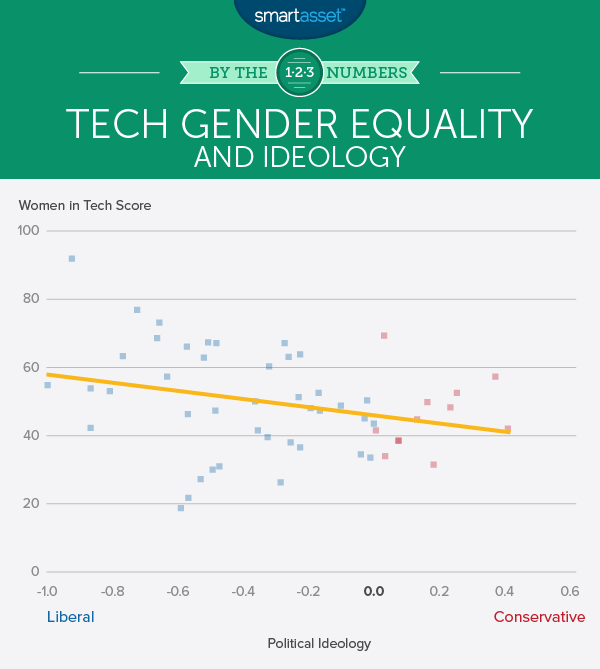 We used data from our best cities for women in tech study and compared it to political ideology. As a refresher, SmartAsset measured how good a city was for women in tech by looking at factors including women as a percentage of the tech workforce, gender pay gap in tech, income after housing costs and three-year tech employment growth. To get a better idea of how we picked the best cities for women in tech please read this year’s study. In general, liberal cities fared better as places for women to work in tech. For example, Baltimore is a liberal city (-0.72) and scored well in our study as a place for women in tech. The only conservative city in our top 10 list for best cities for women in tech was Chandler, Arizona. Our analysis shows that cities that scored high on our study of best cities for living the American dream were more likely to be conservative. In case you missed it, to come up with the best cities for the American Dream SmartAsset looked at data on home-ownership rate, median home value, racial and ethnic diversity, unemployment and inter-generational economic mobility. To get a better idea of how we picked the best cities for the American dream read the full study here. The best liberal city for the American Dream was Allentown, Pennsylvania. Another standout for liberal cities that are great for living the American Dream is San Diego, California. Data for all metrics came from the Census Bureau, except for upward mobility and ideology. 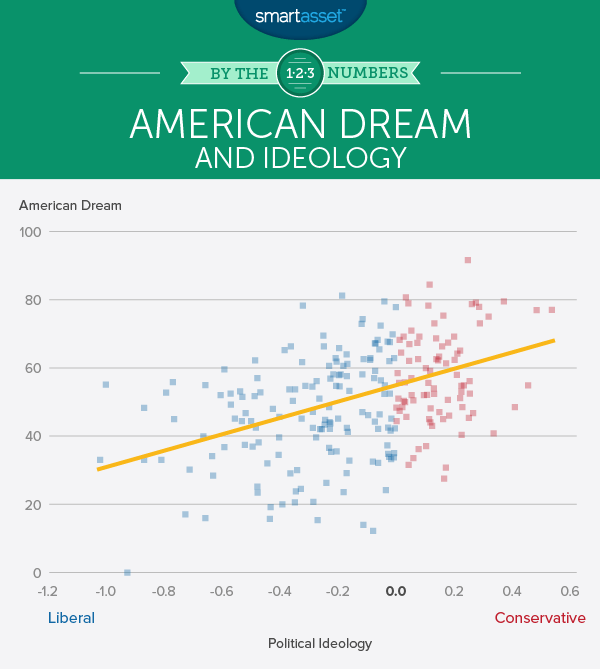 The ideology score is taken from the American Ideology Project. The upward mobility statistic is taken from the Equality of Opportunity Project. We only looked at cities with a population greater than 50,000. Readers should note a few things about this study. First of all, this data does not show whether or not a liberal city is actually enacting liberal policies. It is possible that very socially liberal cities are enacting fiscally conservative policies and vice versa. Another thing to note is that not all liberals and conservatives are united on policy issues anyway. As usual, readers should be aware that correlation does not imply causation.